An ancient tomb complex filled with gold and silver treasures has recently been uncovered in northern Syria, yielding crucial clues about life in some of the world's very first cities. Highly unusual signs of ritual infant sacrifice have also been found in the tombs, which were discovered at Umm el-Marra, 56 kilometres (35 miles) east of the city of Halab (ancient Aleppo). If confirmed, the signs of sacrifice could raise intriguing questions about the beliefs of the site's former inhabitants. The first Umm el-Marra tomb, dating back to 3000 BC, was discovered six years ago by researchers from Johns Hopkins University in Baltimore, Maryland. The latest discovery has revealed at least seven more tombs in the same complex, built over three centuries from about 2500 to about 2200 BC. 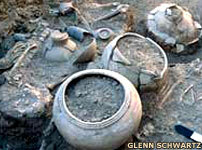 The tombs held a treasure trove of artefacts. One contained a wooden coffin with gold and silver toggle pins and beads of lapis, gold, and carnelian, a reddish mineral often used as a gemstone. In another tomb, three adults were found buried with gold and silver ornaments and vessels, ivory combs, and furniture inlaid with ostrich eggshell. Signs of ritual human and animal sacrifice - including puppies, decapitated donkeys, and the skeletons of infants - were also found. The animal skeletons found are predominantly of equids, or members of the horse family, most likely donkeys, onagers (donkeys' wild cousins), or a hybrid of the two. But archaeologists also found puppy bones in the tombs. A previously unseen variety of writing was also found carved into four small clay cylinders uncovered in one location. Johns Hopkins archaeologist Glenn Schwartz, who led the research, believes the tombs were for members of the city's royalty or upper class. "I suspect that the sacrifice of these equids in our tombs has something to do with their association with the highest rank of society," Schwartz said. "It would be like a wealthy person today being buried with his or her Rolls Royce." Remains of an adult female in the tomb complex which also contained a form of writing never seen before. The new tombs were excavated in 2002, 2004, and 2006, with funding from the National Science Foundation, the National Geographic Society Committee for Research and Exploration, New York's Metropolitan Museum of Art, the Dellheim Foundation of Baltimore, and Johns Hopkins University. Umm el-Marra is located in the Jabbul plain of northern Syria, just west of the Euphrates River. The area was once the centre of a critical trade route, connecting the Mediterranean Sea to points as far east as Afghanistan. 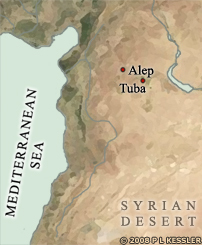 Schwartz says he believes Umm el-Marra is the site of ancient Tuba, one of Syria's first cities and the capital of a small kingdom. As urban centres began to form in Mesopotamia and what is now Syria, the newly emerging elites had to cement the legitimacy of their rule, Schwartz says. The new finds at Umm el-Marra - its centrally located 'royal cemetery' is unique among cities of its era - may explain how those at the top got others to buy into the new social order. "One of the ways they did it, it would seem, was by venerating rulers and burying them in the middle of the community. This made them constantly present," Schwartz explained. "The living rulers could point to their ancestors and say, The same people that we are venerating as ancestors, they are my predecessors. Let it be recognised that they were illustrious rulers and my own authority is thus justified." Schwartz believes the tombs were also meant to convey these same messages of power to competing city-states. "The elite in the different cities were trying to impress one another," Schwartz said. "These tombs are not subterranean - everyone can see them all the time." We may never know the answer to perhaps the most intriguing question: Why were puppies and babies buried together with the deceased in Umm el-Marra? There is almost no archaeological evidence to shed light on ancient Syrian society's rituals and beliefs, according to Augusta McMahon, a lecturer in Mesopotamian archaeology at England's University of Cambridge. 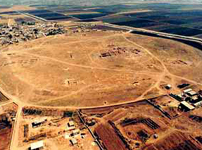 McMahon is sceptical of Schwartz's claims of infant sacrifice at Umm el-Marra. "We have no other documentation that I know of," McMahon said. "There is no textual reference to this sort of behaviour." She suggests that high infant mortality rates may have led to mass burials of Umm el-Marra babies in the royal tombs. "If there is an aspect of child sacrifice, you get to questions like: which children were they? Were they the children of upper classes, the elite, the people in power who belong in the tomb? Or are they children of lower classes who were forced into this? You are confronted by a whole lot of uncomfortable questions which demand explanations," McMahon said. 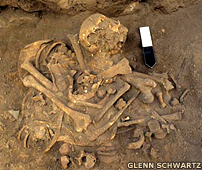 While admitting that high infant mortality rates might explain the unusual burials in Umm el-Marra, Schwartz sticks to his hypothesis. "There is evidence of human sacrifice in other burial contexts," he said. "The most famous is the city of Ur in southern Mesopotamia. "We don't know for sure if these infants [in Umm el-Marra] were sacrificed. But I think it seems to be likely, because they are found in architectural features that otherwise contain the skeletons of animals that clearly were sacrificed." Both McMahon and Schwartz agree that the newly discovered material at Umm el-Marra will allow researchers to paint a much more elaborate and colourful portrait of early urban civilisation in Syria. Images and text copyright © National Geographic News or affiliates. Reproduction is made on a 'fair dealing' basis for the purpose of disseminating relevant information to a specific audience. No breach of copyright is intended or inferred.